can we start a cheating scandal for hiding a low profile tank? It will probably be KREIG that is dominant. They have the deepest roster of good players, and they platoon often so they know how to play with one another. As a 501st member; KRIEG is gonna dominate. We have little chance. Just hope CW rewards are available to 501st SOMETIMES. krieg cant win everytime. Yes, but so do all of the truly good clans platoon basically always. Sparta and krieg/att will do well. But Titan/DFNT/resistance and triarii will also do well! You figure all the unicums get their marvelous win rates mostly by squashing random pubbies with sub-50% WRs...I'm kind of curious to see how well (or NOT well) everyone will do when those amazing unicum skills and stunts are equalized by the playing field being full of 60/70%ers. We're awful. I have our members downloading Candy Crush as we speak. yep. This is also why skill-based / winrate-based matchmaking would not be favorable. If great players were always going up against great players, we would not have any 70% players. Anyone that thinks clan wars is going to mean your clan fighting tanks from another clans tanks is...well...it just aint going to happen. You'll have clan missions just like the missions you have now. That's what they mean by clan wars. Honestly this is my thoughts, what is the difference between a 55% er and a 70% er when they both know the tank they are using, are following orders of another player and are spamming prem with fancy consumables. As I see it it is a little map knowledge (which is partially mitigated by a commander with map knowledge), a slightly better understanding of game mechanics (that is what practice is for) and the 55%er probably having a smaller ego. I think it will be more about the comander calling the right plays and their team following those plays then individual ability to make calls, use teammates as meatshields and convince 32% win rate E-100's that you are not supposed to flank on malinovka. May the best ping win. 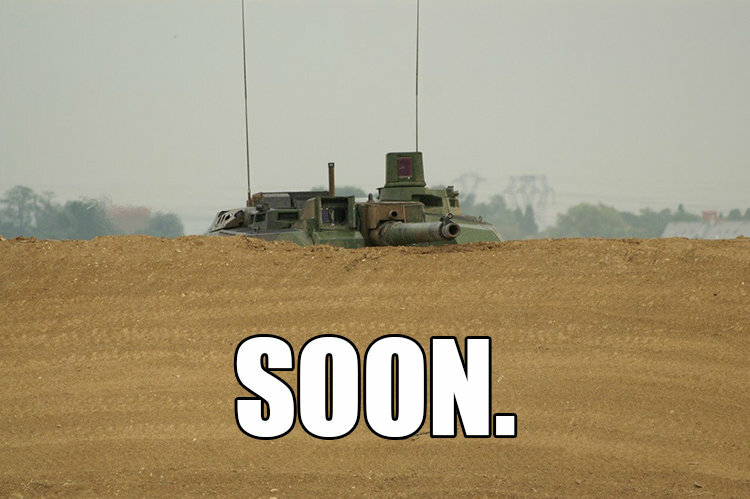 To the people worrying about winning a tank or not, you are more than likely going to win. The good players are already taken up, and none will be left for the pub clans. There are only about 10 big clans now I think, and the majority of good players are taken by them, meaning randoms will be left. Most likely, you could only attack a few times a day, and the noobs won't be able to hold territory. 1. Someday the Castro brothers will fall in Cuba. 2. Someday WoTBlitz will support Clans. 3. Someday WoTBlitz will allow us to organize our friends list. The thing about all three somedays is…uhm…the Cuban Missile Crisis was in 1962, you dig? I forget if it was JFK or LBJ who first said, "Fear not, this is but a temporary setback; Wargaming will soon sort our friends according to who is currently on-line." There have been a few posts from mods and in the RU server translations that hinted at before the end of the year. I agree though, where is that hull down T72 meme? Edited by Camoisland, 06 July 2015 - 02:03 AM. CW is just as much about politics and strategy as it is about how good the players are, and how many of the players you have. Ahhhh THIS. WG please give me a chance to transfer to Asia server. High ping is my biggest nemesis in this game.